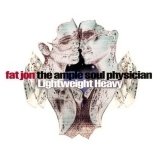 Lightweight Heavy is ranked 4th best out of 4 albums by Fat Jon The Ample Soul Physician on BestEverAlbums.com. The best album by Fat Jon The Ample Soul Physician is Hundred Eight Stars which is ranked number 18927 in the list of all-time albums with a total rank score of 65. Related links: top tracks by Fat Jon The Ample Soul Physiciantop tracks of the 2000s, top tracks of 2002.